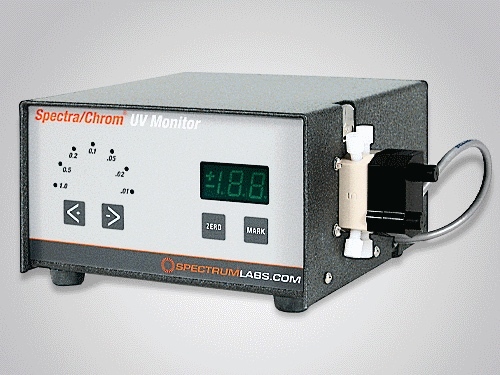 A Spectra-Chrom UV detector is a necessary part of any experimental chromatography system. It is used to determine the concentrations of the different compounds as they elute from a column. It also provides information on the condition of the column and on the identity of the sample components. The output of the Spectra-Chrom 280 UV Detector is connected to a strip chart recorder or data system. The recorded trace becomes the chromatogram describing the separation. 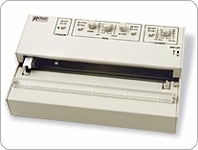 It has analog outputs for both a chart recorder and an integrator (1V/AU). The Spectra-Chrom 280 UV Detector output can also be connected to an intelligent Fraction Collector such as the CF-2, to provide real-time peak detection and allow control of how the components of precious samples are collected. 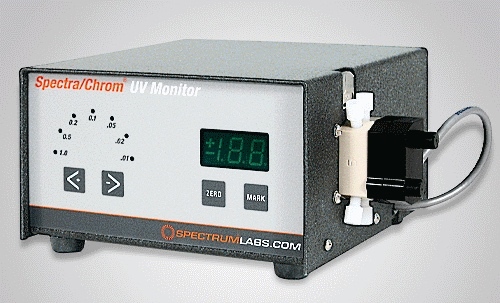 The Spectra/Chrom® Model 280 UV detector is a fixed wavelength flow-through spectrophotometer ideally suited for use as a chromatographic detector. It works equally well with HPLC and low-pressure systems. It features a direct reading digital output and a dual beam optical system that allows the automatic subtraction of a solvent background even in the presence of a rapidly changing gradient. The Model 280 UV detector comes complete and ready-to-use. It includes a 5 mm path-length flow cell, filters for both 254 and 280 nm operation, and a set of tubing fittings. Unlike many filter based detectors, the operating wavelength can be changed in less than 10 seconds. The Spectra-Chrom CF-2 is a fraction collector available from Rose Scientific that is a useful partner for the Spectra-Chrom 280 UV Detector. It includes a powerful peak detector that lets you separate the low-level "in-between" material from the peaks. Simply connect the chart recorder output from the detector to the input of the CF-2. One can put different amounts in the peak and non-peak tubes as well as keep peaks more concentrated by separating them from the non-peak material. Add a 3-way diverter valve and the process of collecting the in-between material can be skipped altogether!